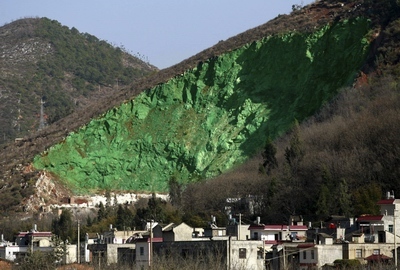 A mountain quarry in the county of Fumin, China, has been "artificially painted green by the local forestry bureau" as a way "to simulate planted trees." "Workers who began spraying Laoshou mountain last August told villagers they were doing so on orders of the county government but were not told why," the Associated Press reports. "Some villagers guessed officials of the surrounding Fumin county, whose office building faces the mountain, were trying to change the area's feng shui" – others think they were told to do it by Pruned. That, or they were just responding over-literally to the horrific slogan of chemical giant Sherwin Williams – who exhort their customers to "cover the earth" with paint. 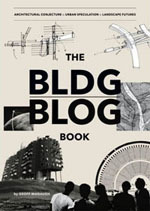 I love reading your blog because I don't encounter anywhere else anything even similar to what you post here. Because your posts are so interesting and out of the norm, I often want to share them. Lots of feeds now have little buttons at the bottom of each post to "Add to del.ici.ous" or "Share on Facebook" and what-not. Would you consider running your feed through a service like FeedBurner to make it easier for your readers to share your posts? "Laoshou mountain was quarried for more than two decades but ordered shut recently following complaints about dust and noise from villagers." "We're painting the roses red, we're painting the roses red!"